Welcome to our farm! Mind your step, though - it's a busy, bustly place. There's lots of noise, there are lots of comings and goings and lots of farmyard folk - animals included. This fun and educational musical takes us on a tour through the changing seasons of the year as Apple the pony tries to find a hat suitable for the weather. 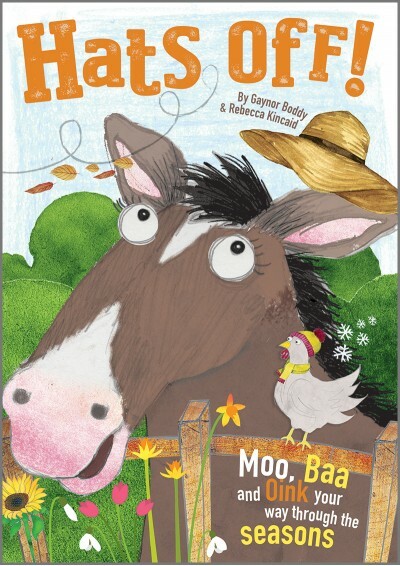 So, let's moo, baa and oink our way through the seasons with this adorable musical, suitable for 3-7 year olds. With a simple script full of loveable characters and 7 fun, catchy songs, Hats Off! is the perfect production for Early Years and Key Stage 1. Available with Words on Screen™ v2. Apple the pony is very confused. She has found a lovely hat, but cannot seem to find the right season to wear it in. Everyone is relying on Einstein the cow to work it out, but will Goat eat it first? Join the chilly chickens, Buster the howling puppy, the crazy party pigs and all the other animals as they take us through their favourite seasons in this exciting musical. With a humorous script full of small speaking parts and larger-than-life characters, and seven catchy, fun songs, this is the perfect infant production for any time of the year. Character List and Staging notes. No. of speaking parts: 20. Can easily be increased to 32 and reduced to 15. See staging notes for more details. It's H, H, H, H, H, Hot!